In order to increase the effectiveness of in-person, in-language health care enrollment assistance, Action for Health Justice (AHJ), released a glossary of commonly used health care terms today. The glossary was created in response to a lack of reference tools for those working with people who do not speak English very well or at all to provide concise and accessible definitions. AHJ is the only national group working to reach and enroll Asian Americans, Native Hawaiians and Pacific Islanders (AAs and NHPIs) through one-on-one assistance, in person, to those who need help navigating the enrollment process or require assistance in Asian and Pacific Islander languages. The work is crucial to reaching a community where one in three have difficulty, speaking, writing or reading English. The glossary is available for purchase in Chinese (Traditional), Korean and Vietnamese. The price varies from $125 – $1250 per language, depending on the type of organization requesting access. In the coming weeks, AHJ will add the following languages: Tagalog, Hindi, Vietnamese, Khmer, Laotian, Burmese, Tongan, Chuukese and Marshallese. Action for Health Justice worked with certified outreach and enrollment assistors to prioritize common health insurance terms such as premiums and deductibles. During the first open enrollment, AHJ partners experienced challenges with in-language outreach. Even when working one-on-one with bilingual consumers, they found it difficult to clearly explain insurance terms and concepts in Asian and Pacific Islander languages. The glossary is a resource to help assisters overcome the gap and provide accurate translations and help more people get covered. 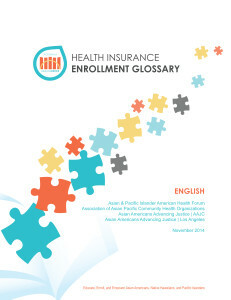 For more information about the glossary and health reform resources available in English and Asian and Pacific Islander languages, visit http://bit.ly/AHJ-glossary.